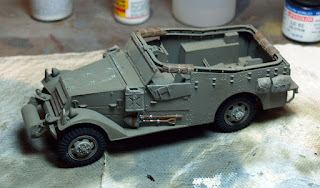 I am progressing with the Scout Car, as you can see. I have found this a tricky project as the instructions are not clear and I have had to tear it apart a few times and re-work it. Also, quite a lot of the detail is a bit soft. Still, as you can see it is coming along now. The other side needs the wheels painted and the interior details need bringing out. Then it needs a panel wash with heavily diluted Games Workshop brown ink. Then some weathering, but not a lot, I think as I want to try a different look this time. Once that is done, I need to find some suitable figures. I have not yet tackled any 1/35th plastic figures so that will be interesting. In the meantime, I hope to finish this by the weekend. Once this is done, I am getting back to the BR-52 - at last, did I hear my wife say?